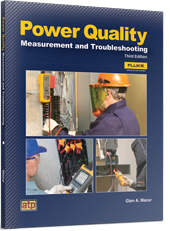 Power Quality Measurement and Troubleshooting covers the fundamentals of power generation, power, distribution, power quality, monitoring, and troubleshooting. Online and portable power monitoring concepts are detailed for commercial, industrial, and residential applications. Power quality measurements with various types of test instruments are introduced with common applications. This textbook also addresses personal protective equipment based on requirements specified in NFPA 70E®, Standard for Electrical Safety in the Workplace. Chapter reviews and activities help reinforce learning of key concepts.